An integrative cancer care approach to provide information, natural options and steps to rebuild your health. Many people come to SFNM following a cancer diagnosis. All are overwhelmed. Some are very confused, believing they stand at a crossroads, having to choose between bad and worse options. Upon diagnosis, at this critical moment, our expert doctors at SFNM can provide essential support before, during and after conventional treatment. We base our approach on the foundation of a patient's three most compelling needs—completely understanding the diagnosis, receiving individualized natural support during conventional treatment and restoring your body's immune system and health after conventional treatment. 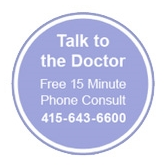 At SFNM, you'll find expert doctors who take the time to explain your diagnosis in terms you can understand. Complex medical terminology can be confusing. Proper understanding of your diagnosis can lay the foundation for improved care later, as you come to understand the nature of your challenge and your options. Once you begin a conventional cancer treatment, we can help in two key ways. Many naturopathic therapies can be effective adjuncts to surgery, chemotherapy and radiation by supporting the body’s ability to heal itself. These natural therapies—nutritional and herbal support, acupuncture, and IV nutrient therapy—have a second benefit. They can improve the success of chemotherapy and radiation therapies, and at the same time help to prevent and reduce their side effects, thereby improving your quality of life. We can help you choose the natural therapies that are right for you. After treatment, patients often find their immune system compromised. As a result, they can be vulnerable to a host of new health problems. By customizing natural therapies to support conventional treatments, we can help you experience fewer or lessened side effects. With side effects controlled, your body's immune function improves. An improved immune system can promote overall health and extend remission. Time and again, we have seen how our integrative approach, customized to the individual, can help cancer patients enjoy a better quality of life, achieve a higher success of fighting cancer and ultimately maintain good health. Let us show you how our expert naturopathic doctors can provide you with invaluable support during this critical challenge. At San Francisco Natural Medicine, intravenous nutritional therapy (IVNT) is one of our most useful and popular therapies. Our doctors use IVNT to replenish nutrients in people with chronic illness or absorption problems, to support and strengthen the immune response, to help fight infection, to support people with cancer and a host of other health issues and concerns. The doctors at SFNM support an integrative approach to cancer care and we will continue to monitor research like this so we can better serve our patients using the latest research findings.